Law enforcement agencies throughout Sarasota County will be participating; the hours are 10 a.m. to 2 p.m.
Law enforcement agencies throughout Sarasota County will participate in a national Drug Enforcement Administration (DEA) event on Saturday, April 30, to properly dispose of turned-in prescription medication, the Sarasota County Sheriff’s Office has announced. The event will run from 10 a.m. to 2 p.m. The Sheriff’s Office has permanent drop boxes at both the Criminal Justice Center, located at 2071 Ringling Blvd. in downtown Sarasota — which is open 24 hours a day — and its South County office, located at 4531 State Road 776 in Venice, where the hours are 8 a.m. to 8 p.m., a news release says. 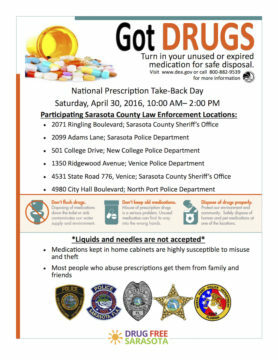 The Sarasota Police Department, the Venice Police Department and the North Port Police Department — which also have permanent drop boxes in their lobbies — will be participating in Saturday’s event as well, the news release notes. Additionally, the New College Police Department, located at 501 College Drive in Sarasota, will accept unused and expired medication, the release adds. Prescription and over-the-counter medication in solid dosage form — such as tablets and capsules — are accepted, the release explains. Liquids and needles do not qualify. While boxes at each law enforcement office location are available to the public year-round, the agencies participate in the national turn-in initiative to publicize the permanent option for proper disposal, the release says. “Medication turn-in is always anonymous,” the release stresses.